Even though small kitchens can be a real pain in the “you know what”, they make us pare things down to the bare minimum—in essence living with the items we actually need rather than kitchen gadgets and toys that we use once, store away and never use again. So to this we say, small kitchens rock! 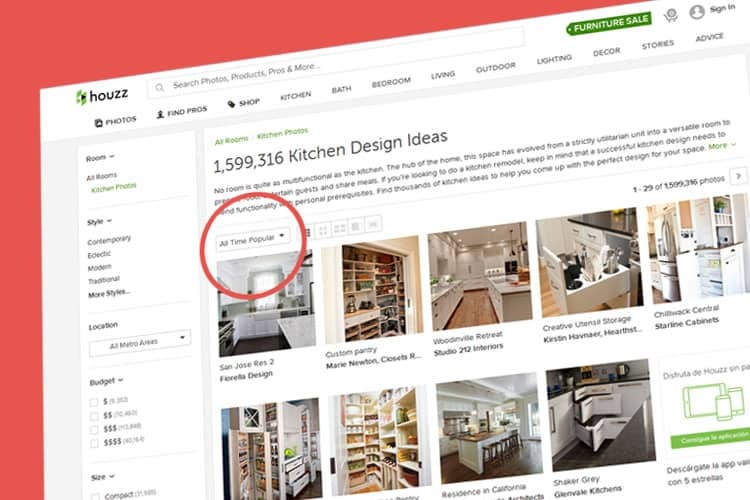 Whether you have a galley kitchen in an urban high-rise apartment or a cozy cottage kitchen in the country, these design ideas will help you organize, optimize and beautify your space, making it the best it can be! The old design rule of thumb applies to small kitchens: use light colors to visually increase the size of a small space. In this diminutive corner kitchen, bright, white cabinets and soft gray walls translate to a light and airy feel. This is the sum and total of the workspace in a cramped efficiency apartment. However, you’ll notice there’s a place for everything and everything is in its place. Consolidate your life and you can easily manage in the tiniest of kitchens. 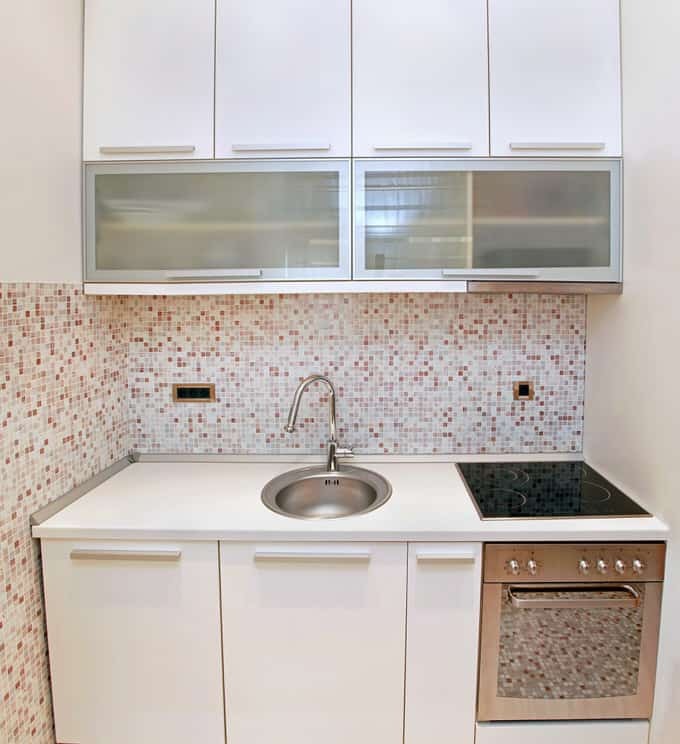 This super small kitchen is the norm in many European apartments. They really know how to make the most of a small space. 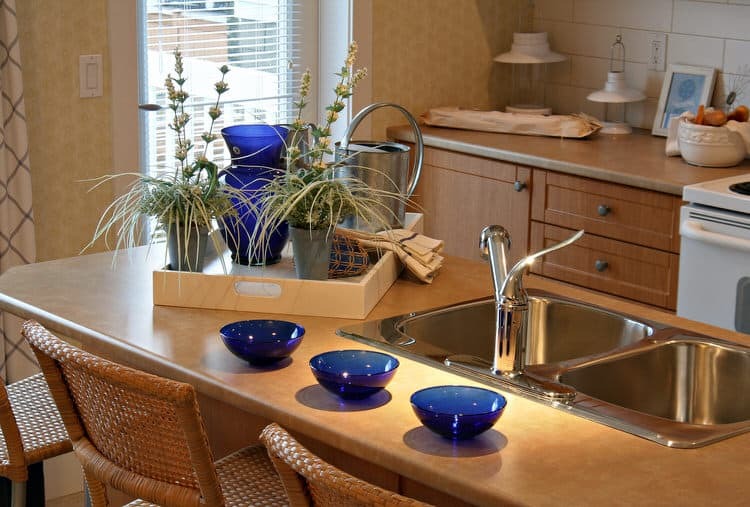 Specially-sized appliances and sinks do their jobs just like the big guys. BTW, we think the confetti-like mosaic wall tiles are to die for. 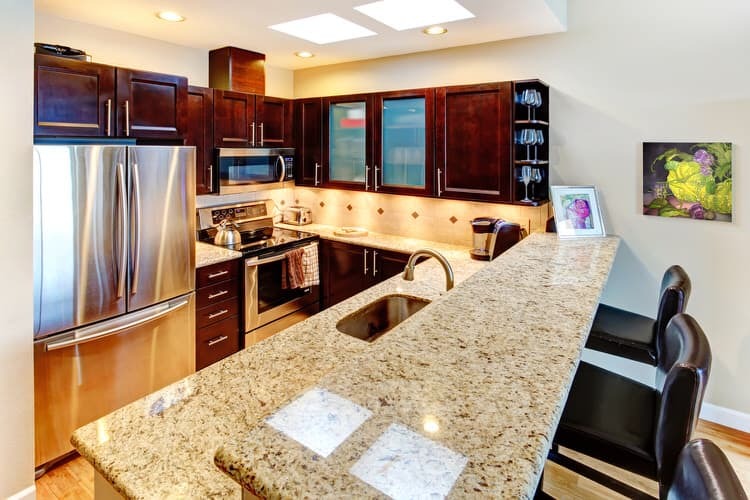 This carriage house kitchen has all the luxury and functionality of kitchen twice its size. 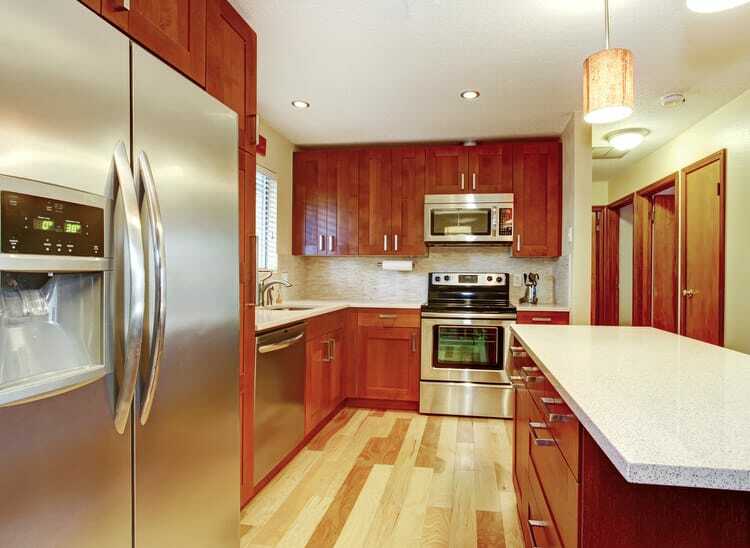 Tasteful maple cabinetry and flooring coordinate with the tropical brown granite countertops. 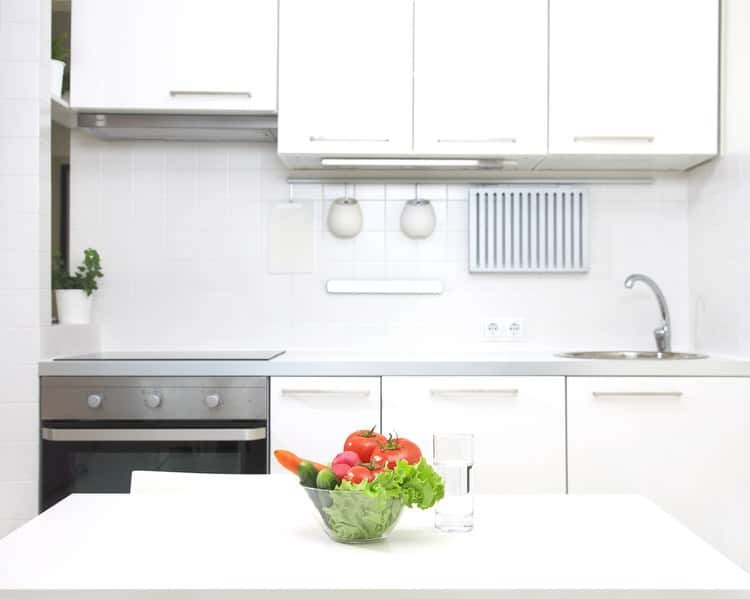 The black appliance package is a nice and cost-effective alternative to stainless. 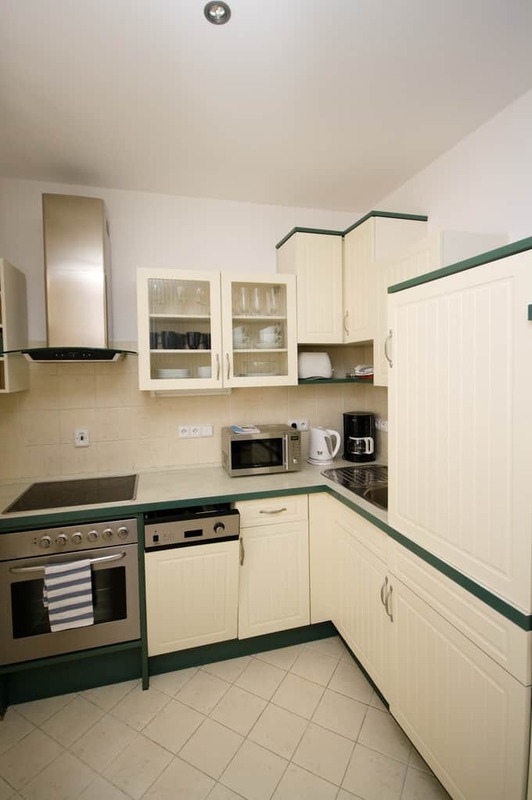 This kitchen is fairly spacious as far as small kitchens are concerned. The kitchen surfaces, cabinetry and appliances line one wall due to the bank of windows on the opposite side. The white table and yellow chairs perk up the modern space. French doors open to a garden courtyard making the space feel even larger. A kitchen island is a rare thing for a small kitchen. The lucky homeowners can enjoy a continental breakfast while perched upon the generous leather upholstered counter stools. 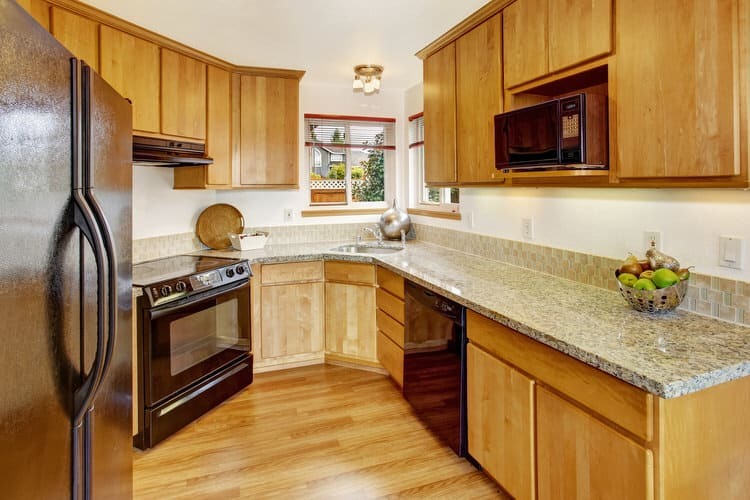 Quartz counters and refinished cabinetry freshen up the look of this 30-year-old kitchen. New stainless cabinet hardware updates the space and works beautifully with the new appliances. 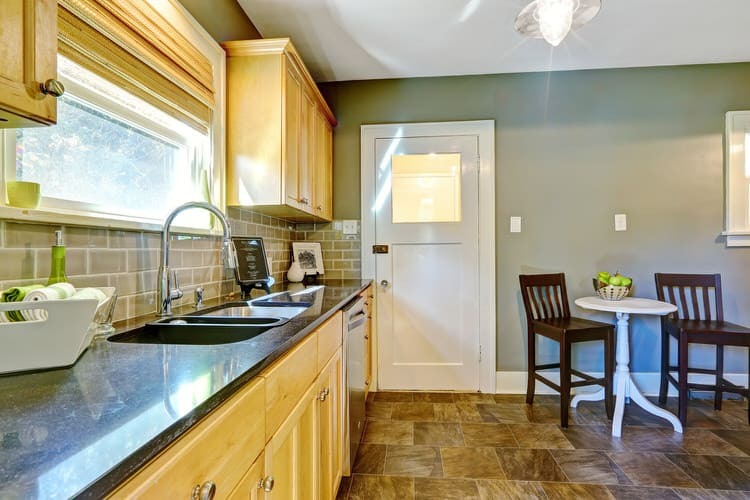 This petite kitchen is not exactly a good example of open concept living. However, it is quite functional and cheery for a basement apartment. Lively finishes and recessed lighting brighten up spaces that lack natural daylight. You can tell this is the kitchen of a techie by the computer stationed at the end of the counter. The limited space squeezes in every modern appliance, including a combination washer-dryer. Storage is at a premium, but this resident seems to have it under control with plenty of upper cabinets. A cute dinette set plays the role of island and dining room in the precious white kitchen. Streamlined cabinets and appliances contribute to this kitchen’s clean and organized look, which is very important when you’re dealing with a small space. 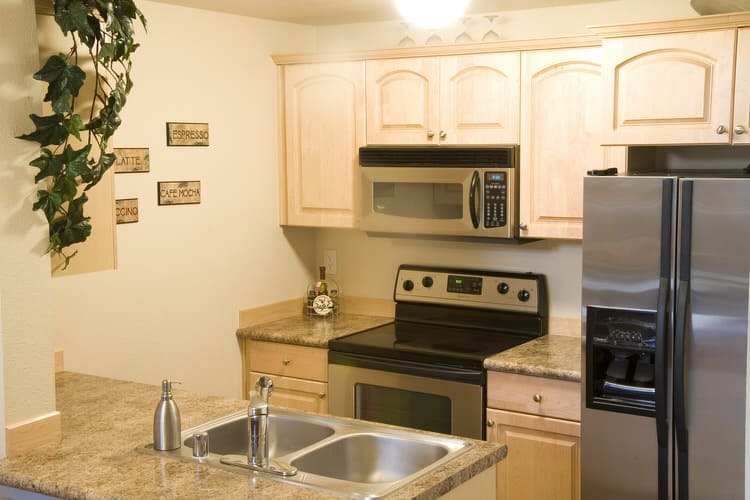 Here is a typical studio apartment kitchen layout in Anytown, USA. The use of full-size appliances and a double sink definitely diminish counter and storage space, but the kitchen still manages to retain its functionality and style. 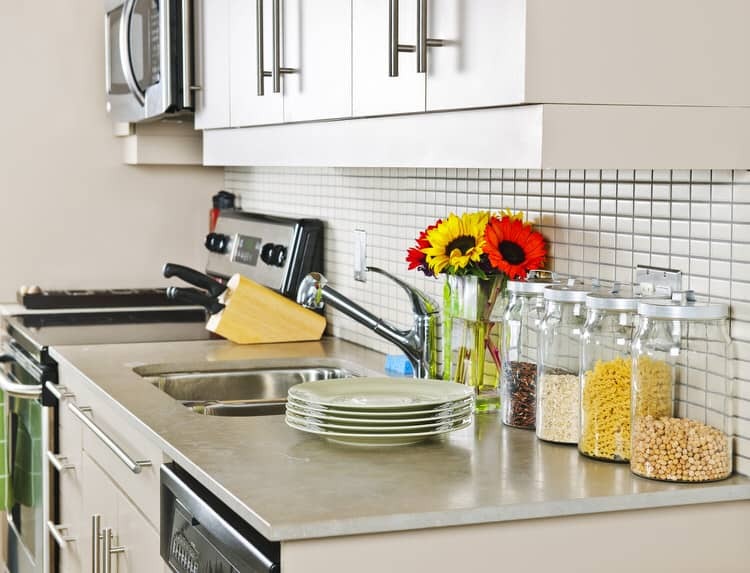 This urban kitchen may be a bit tight, but you don’t have to let that cramp your style. The pass-through design opens up the space and gives you breathing room. White cabinets, counters and backsplash are paired with stainless appliances to maximize the feel. Black and white tile flooring adds unexpected excitement to the small space. An unusual architectural element gives this small kitchen a tad more space and a lot more character. The bump-out atrium has been outfitted with a matching counter, cabinets and open shelves. The owners of the rental property moved the sink under the window to improve the workflow. The refrigerator, yet to be installed, will go next to the counter on the oven side. 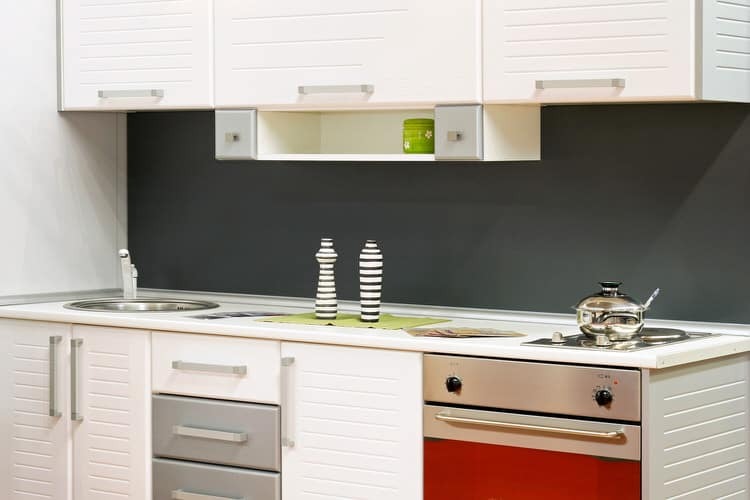 Small kitchens can be cheaply outfitted with modular upper and lower storage units that attach to wall cleats. The sink drops right into the counter and connects to existing plumbing. A half fridge and freestanding gas stove round out the appliances. A homemade table and folding camp stool make up the combo dinette/work station. 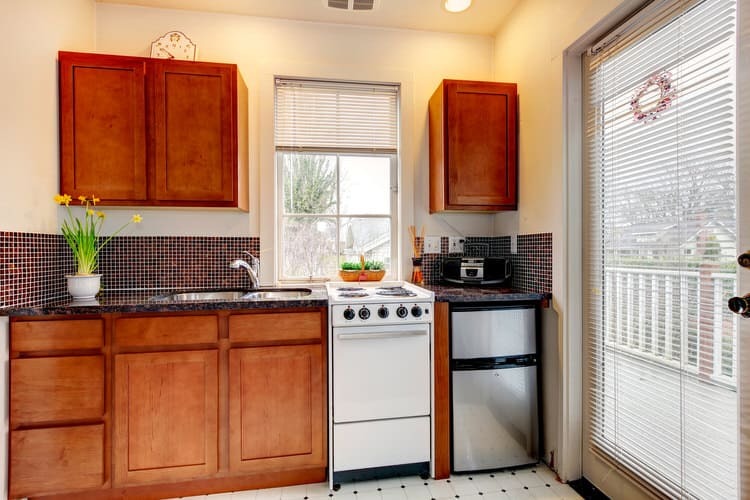 This kitchenette isn’t even the size of a walk in closet, but it does have a cooktop, oven and round bar sink. 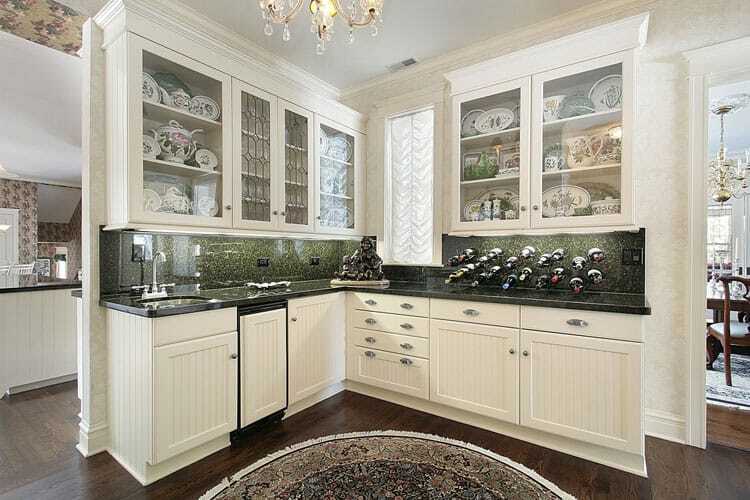 Three upper cabinets can store your dishes, pots and pantry items. A mini fridge is just big enough to hold kitchen basics like milk, eggs and a few sodas. A fun addition to this space is the chalkboard backsplash to make note of your fave restaurant takeout phone numbers! Creamy white and black is the palette of this tiny mother-in-law kitchen. The cabinet front detail and black trim makes for a strong design element in this small space. The refrigerator is hidden behind matching cabinetry for a seamless look. The diagonal floor tile pattern is designed to open up the space. A small kitchen can’t handle much of anything except meal prep and cooking. So it’s important to zero in on function just like in this London flat. The scaled down appliances like the cooktop, oven and microwave free up valuable counter and storage space. The floor space is open enough to accommodate a rolling island that can be moved to another room when not in use. 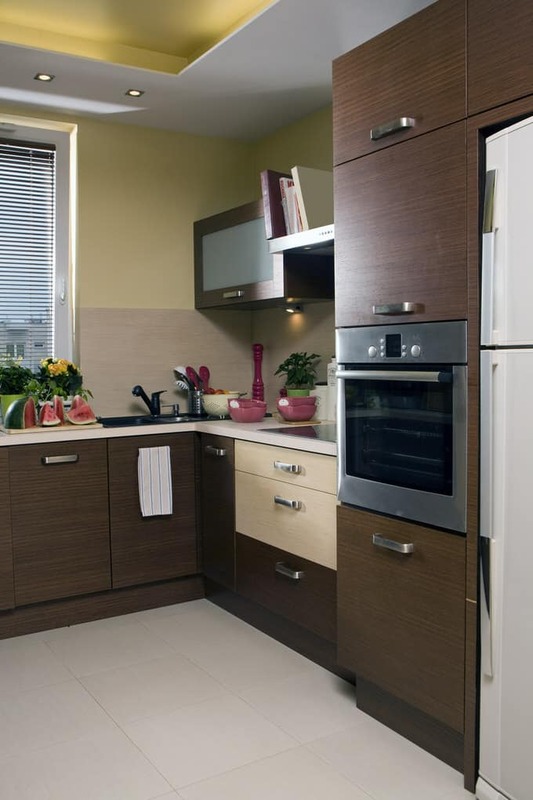 Styling a small kitchen is important in creating a comfortable and homey space. Little pops of color and useful items like cooking oils and dishwashing detergent stored in decorative bottles dress up even the most utilitarian tiny kitchen. The kitchen of this coastal vacation rental has decent space and fabulous furnishings. Unfortunately, it is only equipped with an under counter fridge, making food prep an impossibility. However, the dining space with million dollar views help make up for any minor shortcomings! 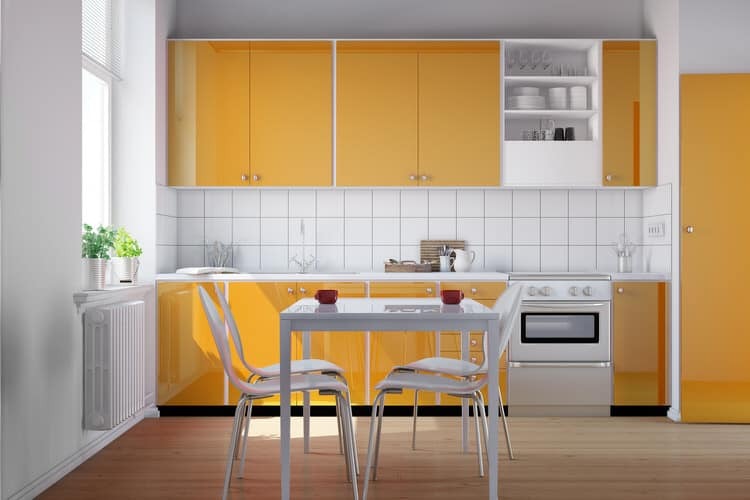 Try adding color to a small kitchen. The cabinets and door of this cute apartment kitchen used to be boring white laminate. A creative owner decided to give them a saturated lemon yellow color. She found paint designed especially for laminate to create a durable lacquer finish. The pumped up color and glossy finish breathes new life into the space. A trip to the Greek Isles has been your dream of a lifetime. 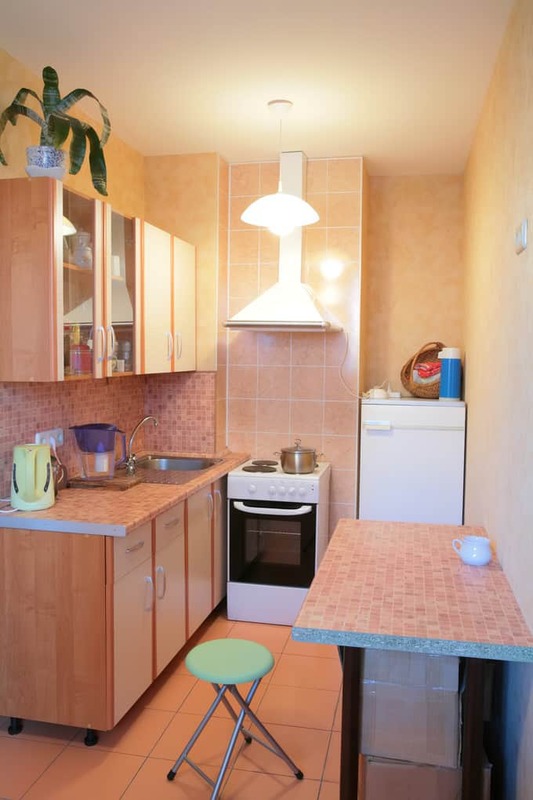 You check into your apartment only to find this barely-there kitchen. Let’s see if it’s functional. Refrigerator—check. Dinnerware—check. Cooktop—check. Sink—check. Counter space—check. Wine, corkscrew and wine glasses—check, check, check. 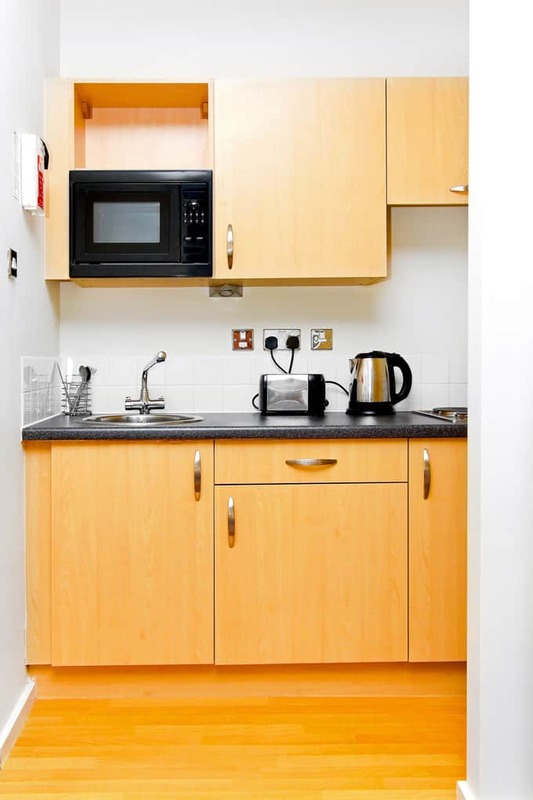 This minute kitchen has managed to squeeze in everything you’ll need for your stay, and then some. Ok, let’s forget about the rule of color and pattern in small spaces. 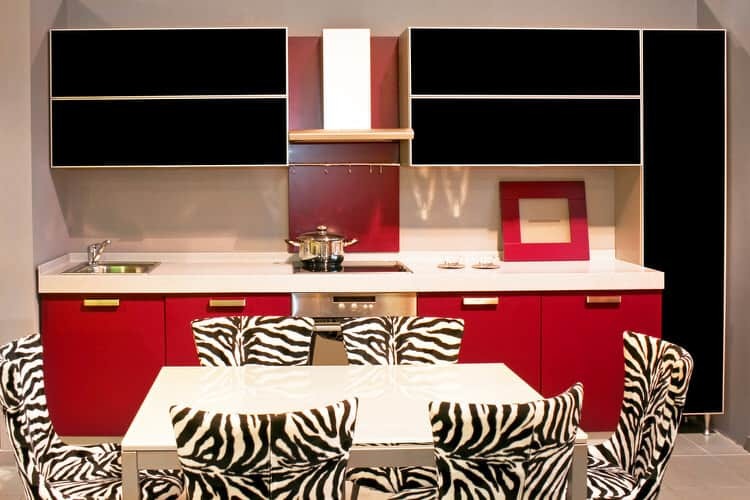 While not exactly our taste, this wild and crazy condo kitchen proves beyond a shadow of a doubt you can use saturated color and vivid patterns in a small space. Does it look good? You be the judge. This loft apartment kitchen in Amsterdam is the essence of chic. The sleek stainless cabinets house all the essentials beautifully and seamlessly. A single industrial pendant lights the space along with dual skylights. You can dine al fresco if the mood strikes. The bistro table and chairs on the balcony are perfect for a intimate dinner for two. 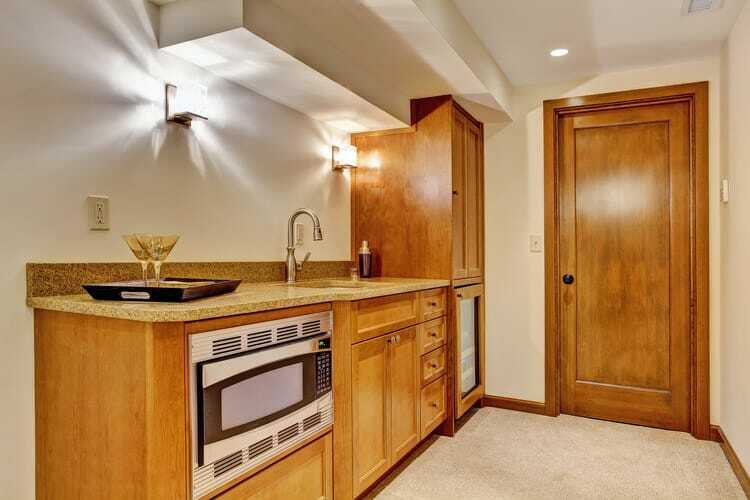 A basement kitchen with an egress window makes the space feel light and bright. 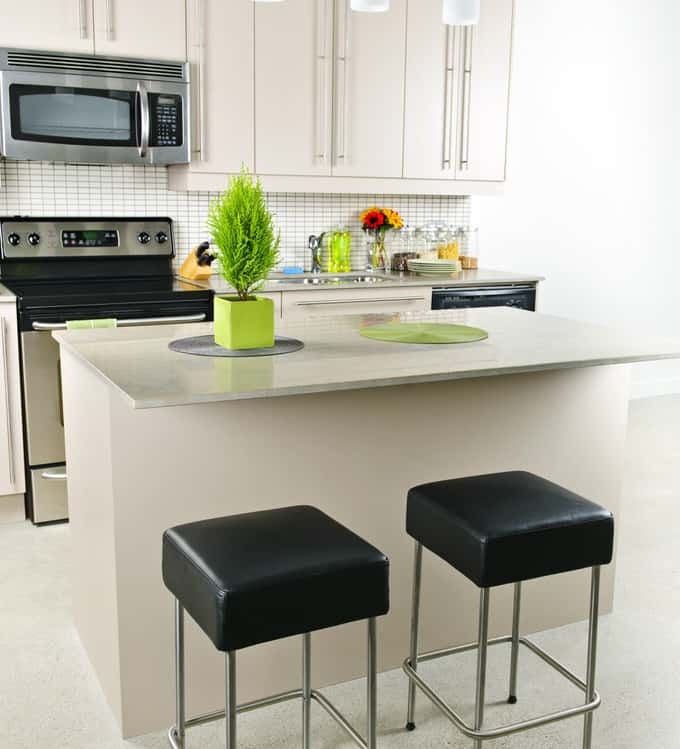 Ceramic floor tiles and soft, sage green walls warm up the stainless appliances and dark granite countertops. The layout is just wide enough to fit a small eat-in table and two chairs. 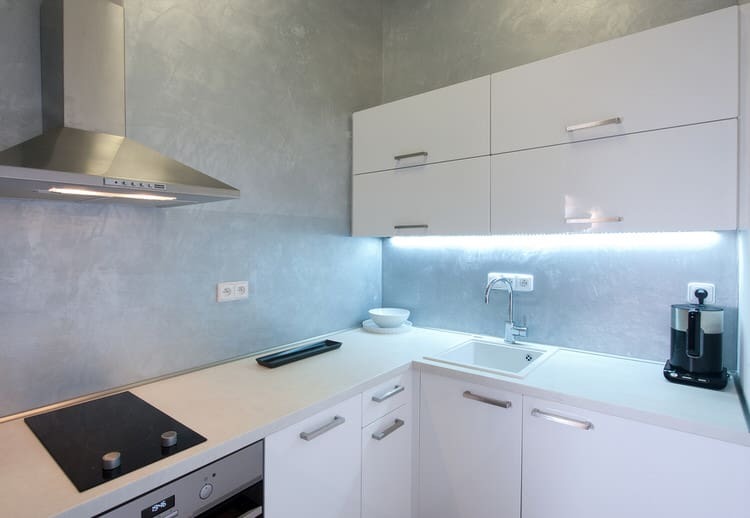 Small kitchens require a combination of task and ambient lighting. To counteract the pale cast of fluorescent bulbs, this homeowner installed LED pin lights under the cabinets to provide targeted task lighting along the work surface. Range hood lighting adequately illuminates the cooktop. But there’s nothing like natural light to brighten the mood. 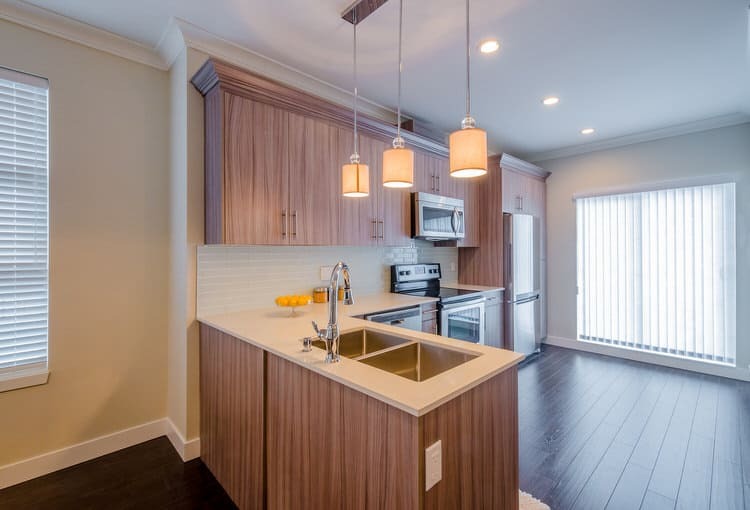 Kitchens in studio apartments can range from small to almost nonexistent. This one is OK—it’s quite efficient and practical. Upper cabinets light the counters and the range hood clears the air and provides a bit of sparkle and architecture to the open-concept space. The full-size oven is on the back wall and the other elements are neatly hidden behind the half wall. 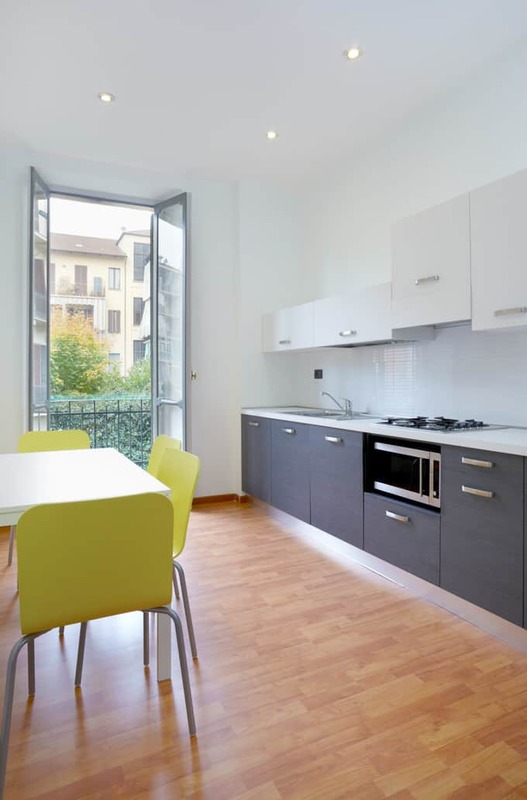 Galley kitchens are quite common in apartments and condos. 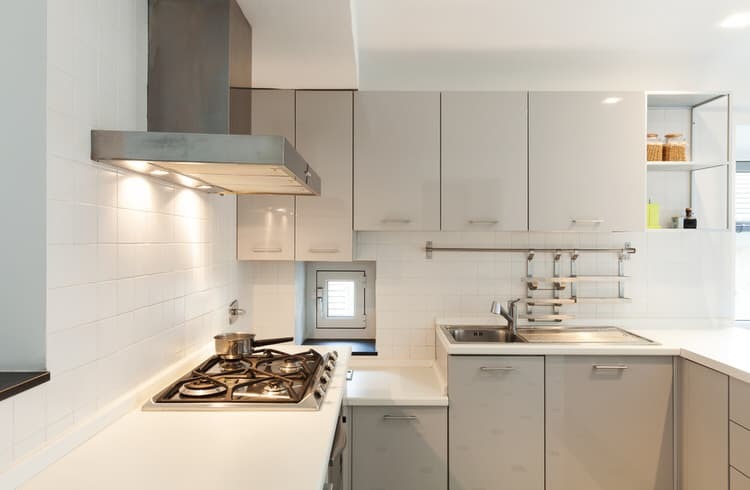 This one has a decent work triangle—defined as an imaginary straight line drawn from the sink to the cooktop to the refrigerator and back to give the space maximum functionality. 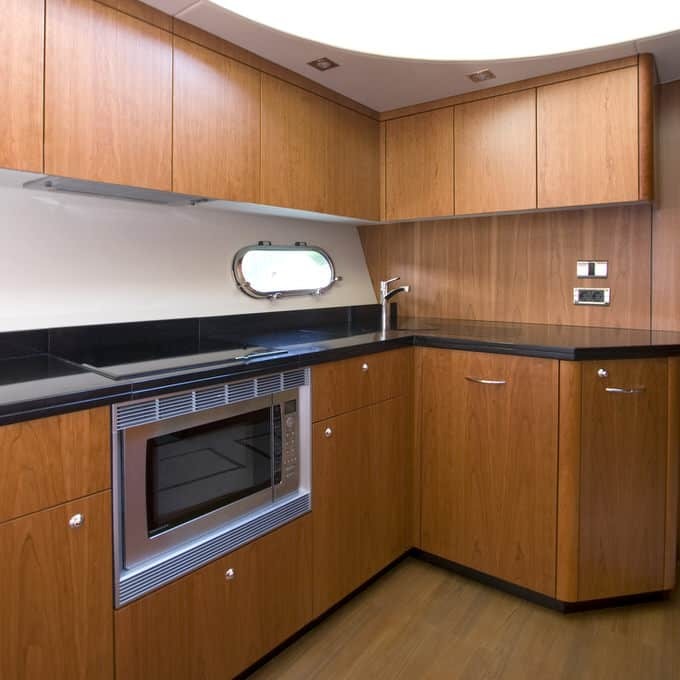 This galley has abundant storage space as well, which is akin to winning the lottery in the world of small kitchens. 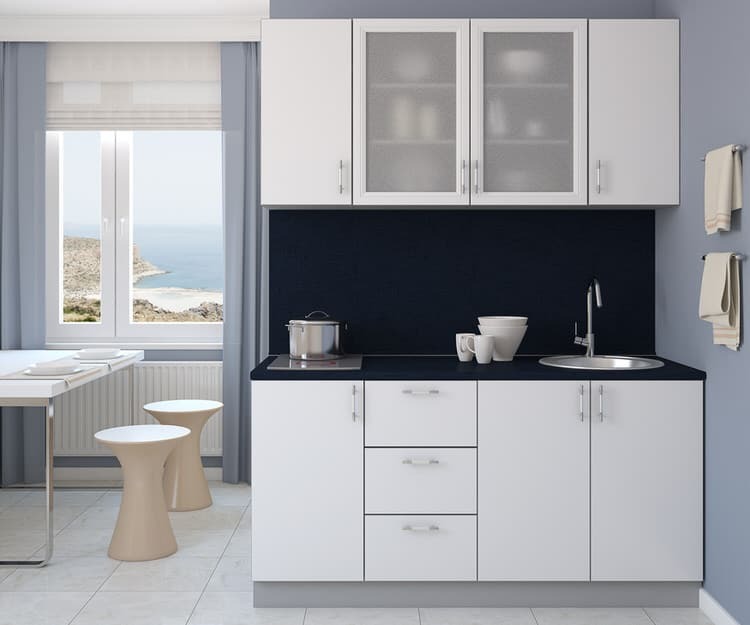 These modular cabinet units work quite well in this small, angled kitchen space. 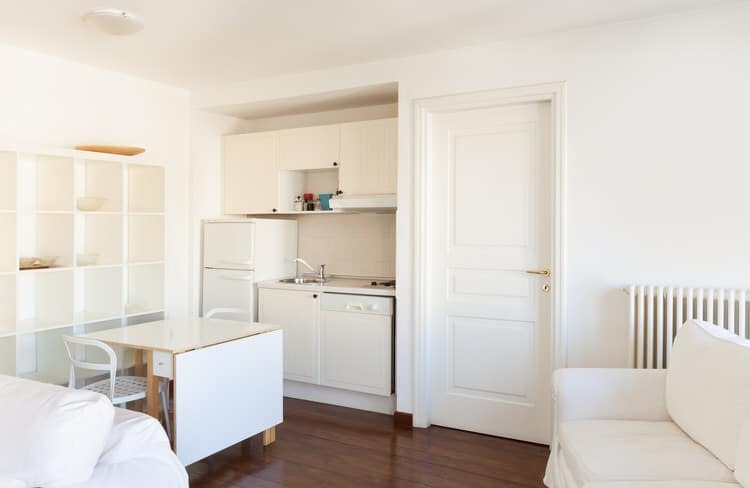 The apartment owner converted the original kitchen into an additional bedroom, leaving this strange common area as the only appropriate space to locate the kitchen. Even though it is not a proper room, the space is delineated by tile flooring versus the wood used throughout the rest of the unit. 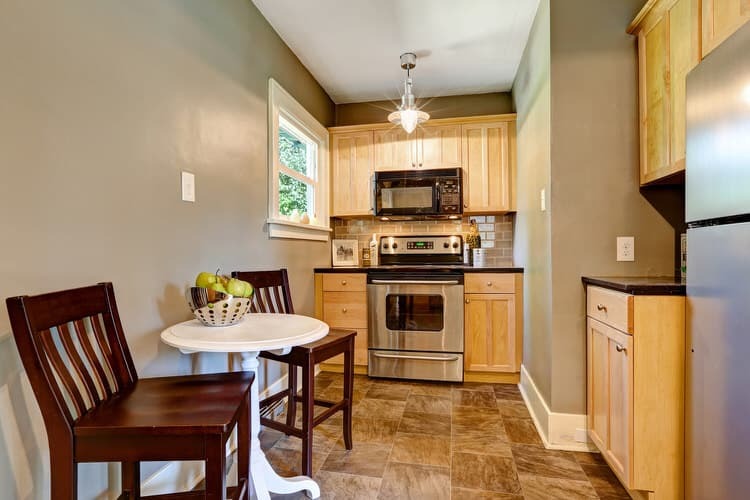 This cute, country cottage has a really dinky kitchen. Rather than using tricks to fool the eye, consider embracing the space just as it is. Why go with a sleek, modern look when you can stick with the cozy cottage feel. If you can, carve out a nook for intimate dining and like this one, choose a rich, earthy colors and textures to create a small, yet sophisticated space. If you are a fan of the 1970s, you will find this small kitchen totally groovy. 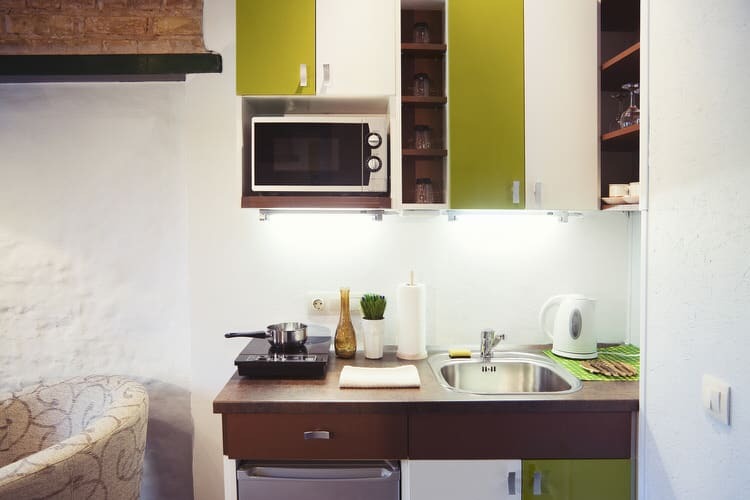 Avocado green and white cabinet doors give this efficiency kitchen a retro feel. 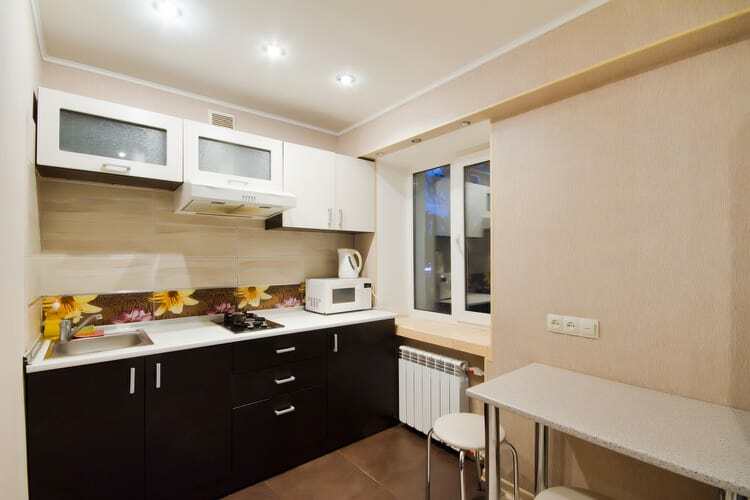 A wood veneer counter leaves precious little work space, but it is equipped with a tiny microwave, hot plate, dishwasher, small sink and electric kettle. Pretty tricked out for a corner kitchen! This scaled-down kitchen has personality plus. The homeowners crammed all the luxury features they could into a small space. 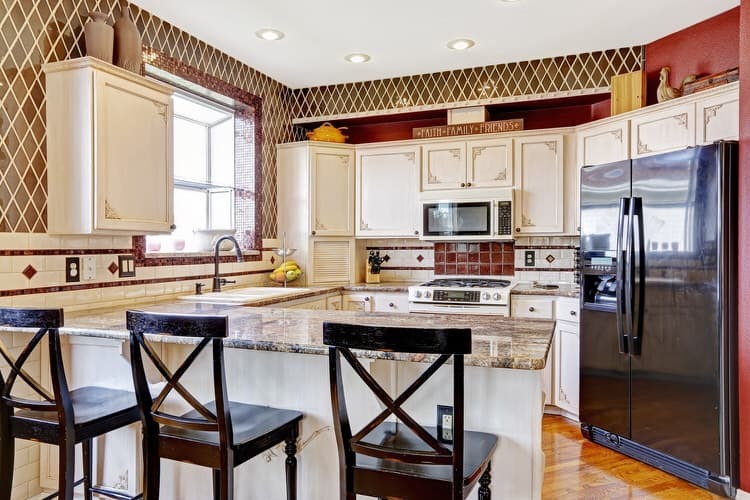 Top-of-the-line cabinets go floor to ceiling and house the combination microwave/convection oven. 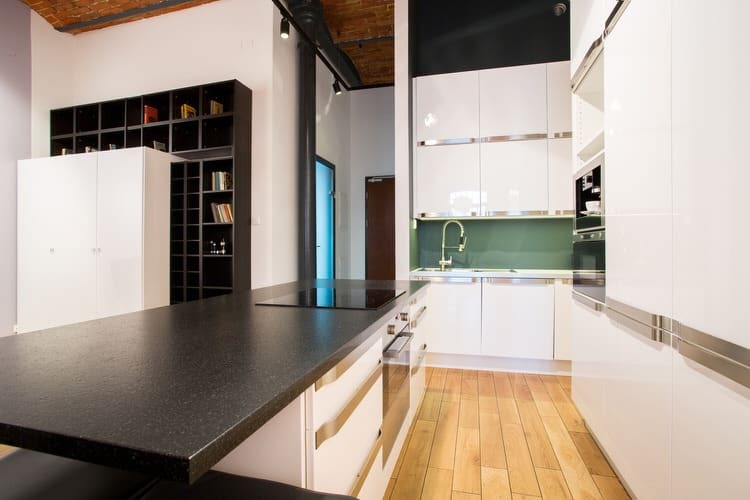 An induction cooktop, built-in barista station, double sink and dishwasher round out the must-haves in this high-end city loft. The grand Victorian has a small, converted studio apartment that is modest, but clean and functional. The kitchen features minimal cabinets offering enough storage and workspace for a single tenant. 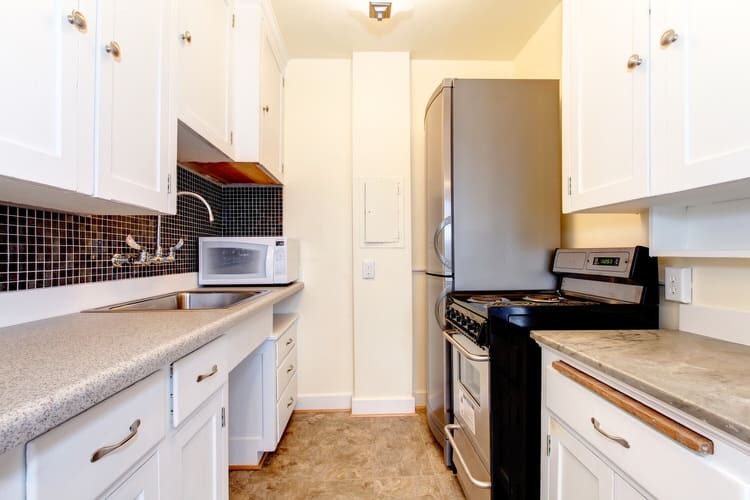 A tiny gas stove, bar fridge and double sink complete the list of amenities. 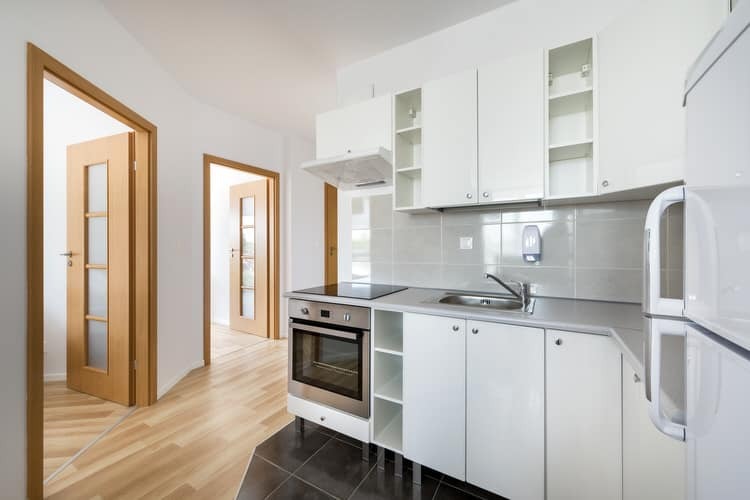 If you’re adding a small kitchen to a rental property, consider this efficient layout. 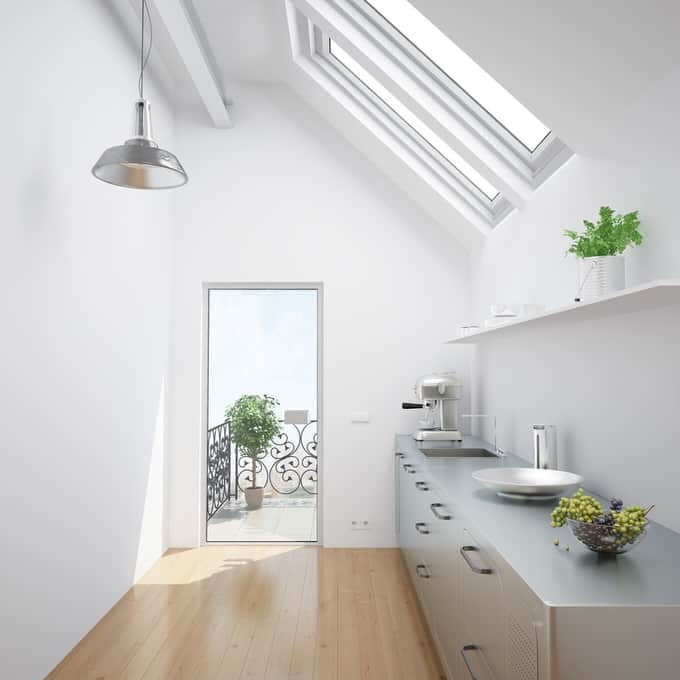 U-shaped kitchens work well in small spaces. The cabinets occupy two walls along with the refrigerator and range. The two-tiered island is big enough to house an undermount pot sink and dishwasher. The espresso cabinetry, warm granite and dark leather stools add to the kitchen’s presence and create a welcoming space for friends and family. 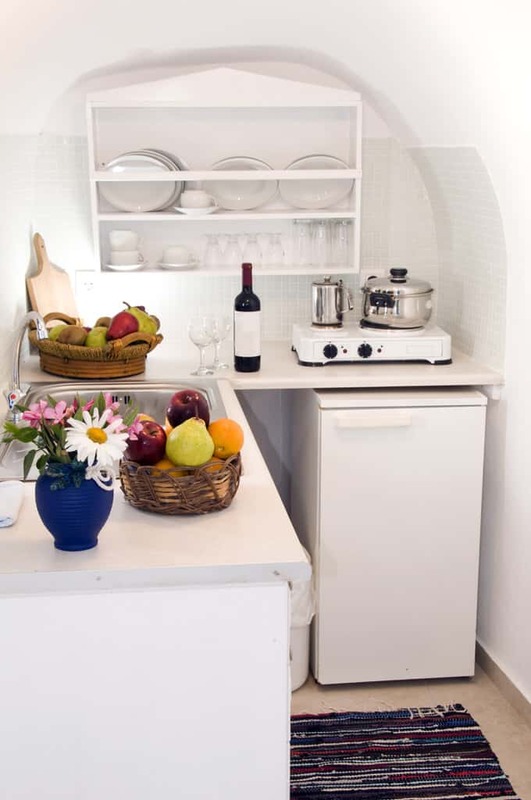 A one-room apartment dressed in white has a kitchen that completely fits into an old closet opening! It may be cramped, but it has everything one might need to get by—providing you don’t want to prepare any gourmet meals. 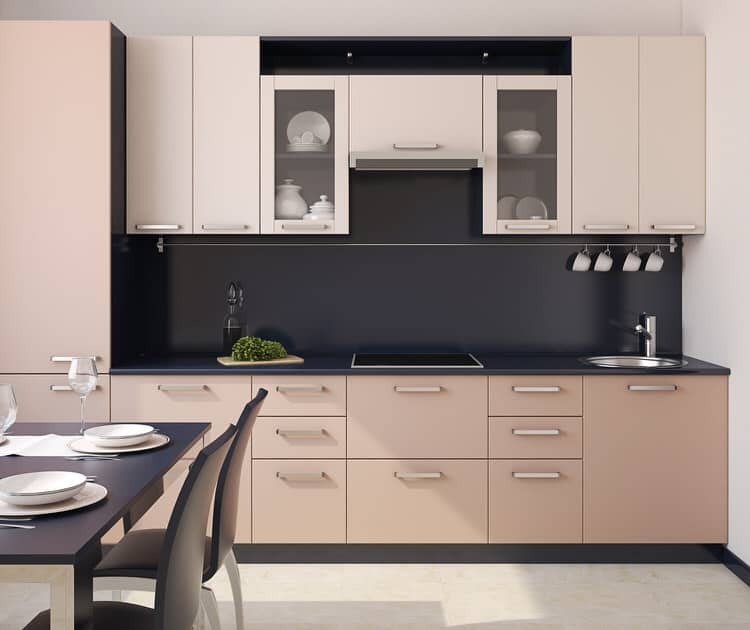 Light peach and black create quite a contrast of color in a small kitchen. Sharp contrasts can be worrisome, but this particular combination work wells in this modern space. The sleek lines of the cabinets and furniture work in concert to optimize the limited square footage. 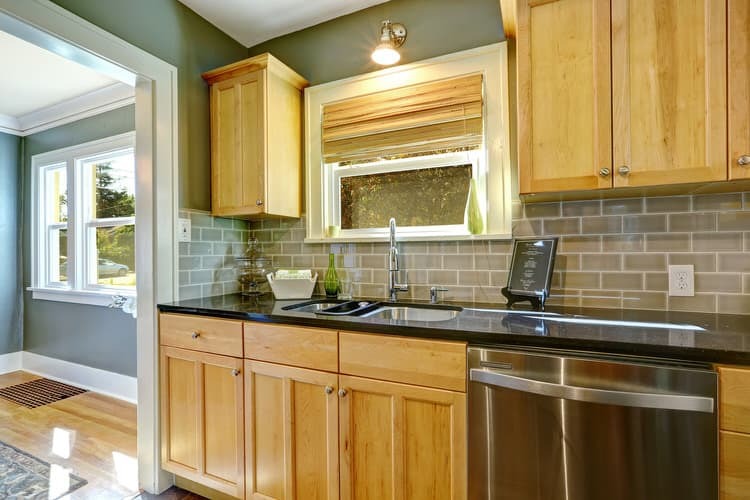 The colors, cabinets and furniture give this little kitchen a big Craftsman feel. 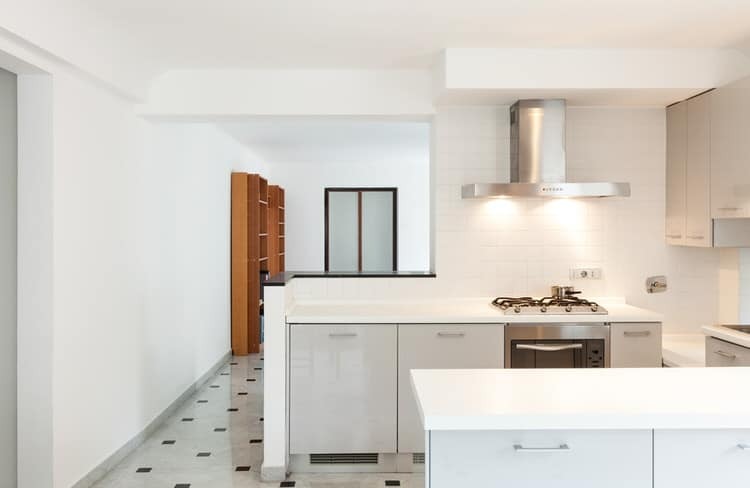 Which proves you should always go about designing a small kitchen just as you would a large one, using the same considerations for flooring, countertops, backsplash materials and plumbing fixtures. Don’t forget extra seating in small kitchen spaces. The peninsula island in this kitchen provides plenty of room for dining, work or school projects. If your home lacks a formal dining room, an eat-in kitchen bar will add value and functionality to the space. A narrow kitchen like this one must maximize colors, surfaces, textures and features to create an inviting, user-friendly space. The owners of this house avoided an extensive renovation by refinishing existing cabinetry and installing inexpensive laminate flooring and ceramic tile on the backsplash. New, energy efficient stainless appliances replace old off-white dinosaurs. A neutral color palette gives this modest and tiny kitchen a clean and stylish look. 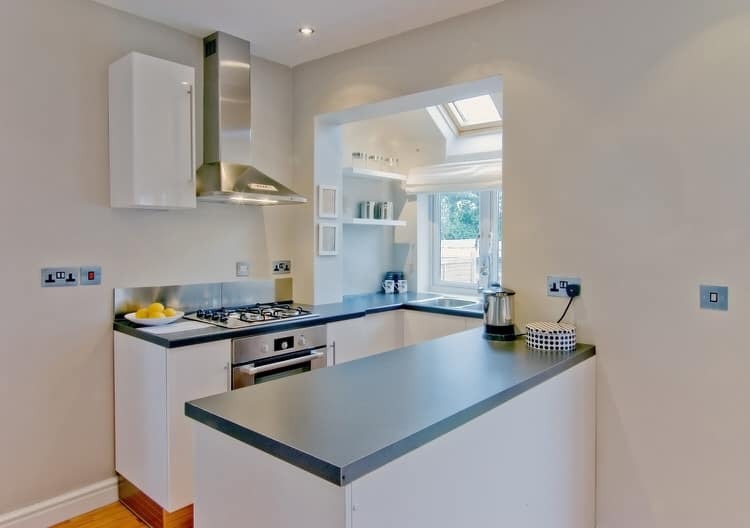 Windows and recessed fixtures flood the work surface with plenty of natural and artificial light. An eat-at bar on the adjacent wall makes this a multi-functional space. Adding a kitchen to this hallway was relatively easy. Electricity and plumbing lines were pulled from the bathroom of the other side of the wall. The space stays light and bright with a combination of sconce and recessed lighting. A create a cohesive look, the owners purchased quality, hardwood cabinetry in a finish that perfectly matches the existing trim and door. 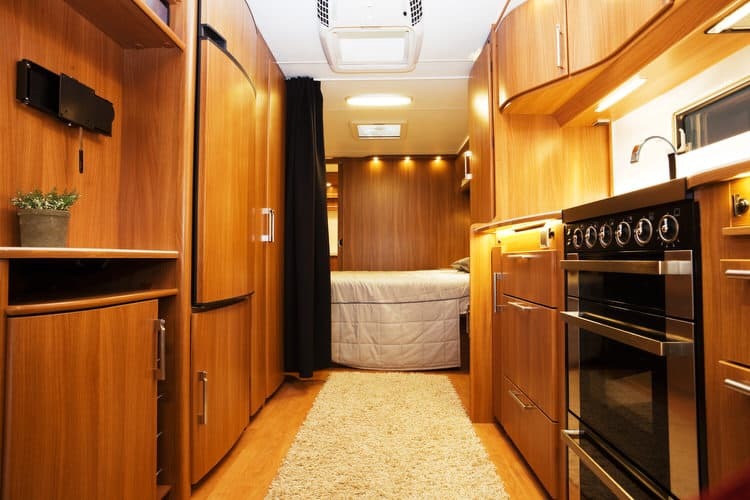 Motorhome kitchens are a breed apart from other tiny kitchens. While space is at a premium, you still need the convenience and efficiency of your kitchen at home. Here’s the perfect blend of form and function. This mobile galley features a stainless appliance package, a double sink, and integrated full-size cold storage and freezer units. All of this plus curvaceous cabinetry wrapped in a rich, exotic wood veneer. 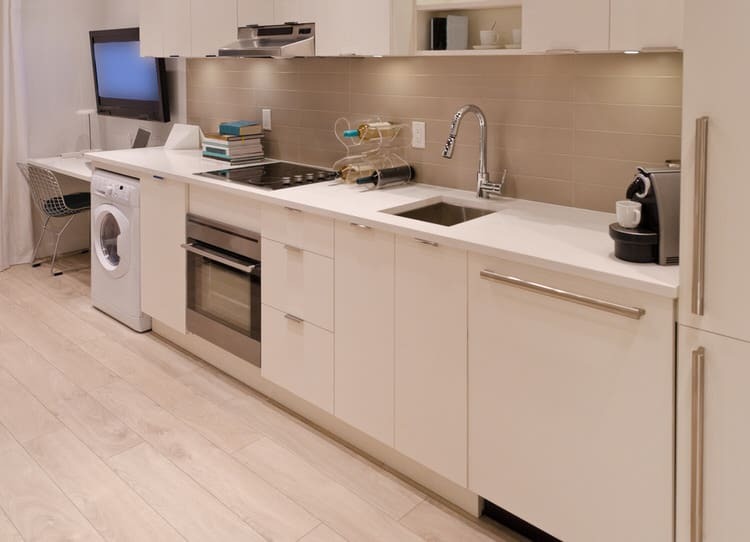 The owners of this studio rental unit wanted to do a kitchen makeover on a shoestring. They chose the look of dark hand-scraped wood in laminate flooring. The ready-to-assemble cabinets were purchased from the local home improvement center. The peninsula houses an extra deep, double stainless sink. 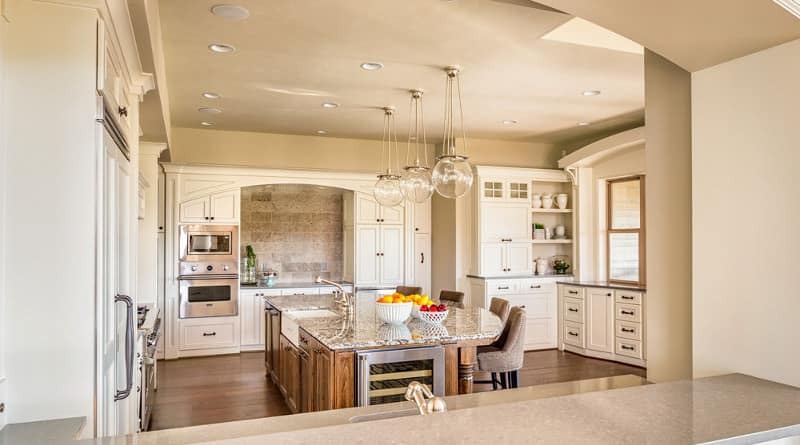 Stainless appliances and a triple pendant kit give this budget kitchen an upscale feel. 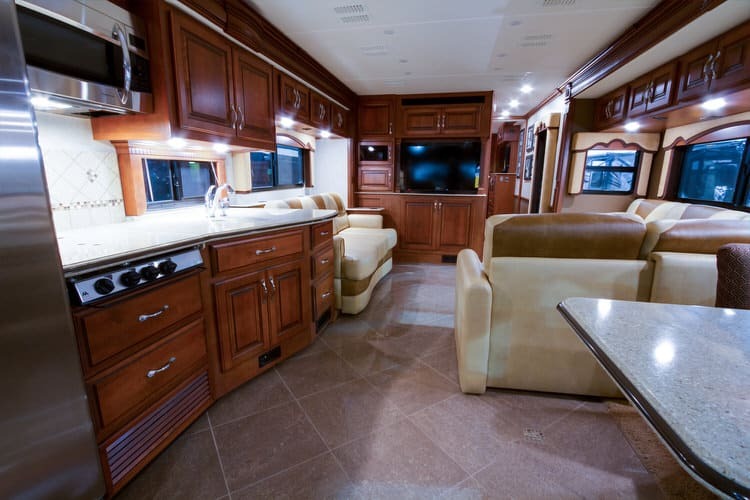 It’s time to hit the road in this tricked-out RV kitchen. Manufacturers realize the new generation of highway adventurers demand the same quality and functionality that they have in their home. 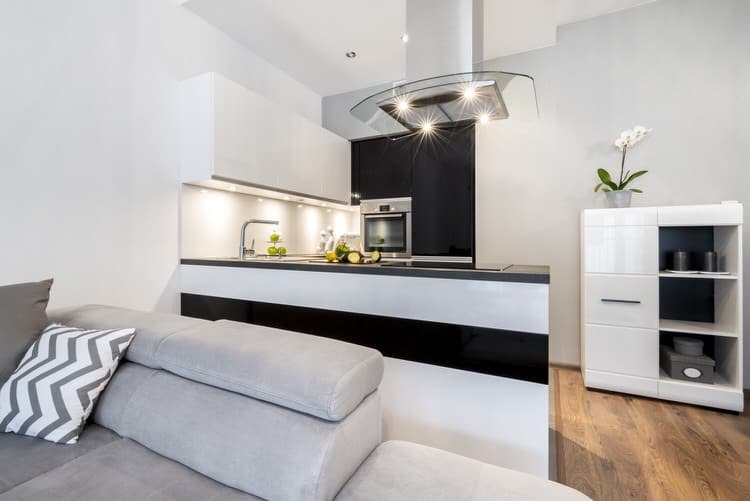 To that end, the industry is incorporating residential design into their carriages with new features like induction cooktops, side-by-side refrigerators and quiet dishwashers that conserve water. Take to the high seas in this nautical galley kitchen. This compact design has some features that might be a bit foreign to land lubbers. Typically the cooktop/oven includes a gimbal system (a marine feature that keeps the cooking surface and oven level to prevent pots and pans from sliding while the boat is moving). Cabinets have locking latches and some upper cabinets feature sliding doors.